Rice tasting is both an art and a science for Zhu Zhiwei and his team at the China National Rice Research Institute. It's a complicated process, and the procedure for tasting a single sample of cooked rice takes about three hours. As the chief rice tasting analyst, Zhu scrutinizes about 900 samples of cooked rice each year. "Three samples a day is the maximum amount with which you can maintain a high level of judgment," said Zhu, 41, who is also the deputy director of the Rice Quality Inspection and Supervision Testing Center at the Ministry of Agriculture. Similar to wine tasting, assessing the quality of cooked rice involves judging its appearance, smell and taste. Appearance includes its shape and "whether the rice grains are pure white", Zhu said. The scent is scrutinized both before and after the rice is cooked. Tasting requires the use of another variety of rice as a control sample. Thai fragrant rice and Japanese Koshihikari rice are most commonly used. The Thai rice is typically used as a control sample for long-grained Indica rice varieties, while the Koshihikari variety is used to assess Japonica rice varieties of short and medium oval grains. Indica and Japonica are two major rice varieties cultivated in Asia, especially China, and account for more than 80 percent of the global rice trade. The rice grains are assessed for tenderness, viscosity and elasticity. "You take a very tiny bite to feel the viscosity and elasticity of the rice grains. Then you look for sweetness as you chew," Zhu said. The rice tasters evaluate after each step. To optimize the process, they carefully measure the amount of water used to cook the rice. Indica varieties, for example, would lose their natural shape if boiled in too much water. "The ratio of rice to water during the cooking process is a crucial element in ensuring the quality of cooked rice," Zhu said. The final analysis requires that the cooked rice be allowed to cool, after which the tasters determine whether the grains maintain their taste through the process. 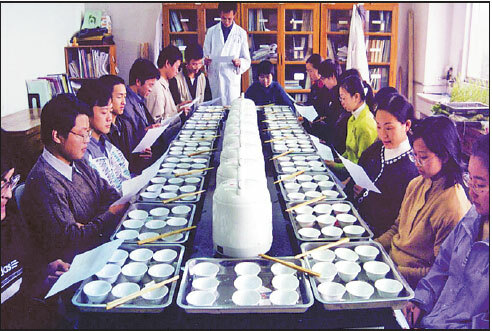 China has not yet drafted a national standard on cooked rice tasting, but the institute's researchers carefully follow a set of procedures and standards to judge rice quality. Japan is the only country that has a national standard on the tasting of rice varieties. It generally takes about three months to train a rice taster, as experience must be accumulated through the tasting of numerous samples. "The more samples you taste, the more sensitive you become. You also need to keep thinking during the tasting process," Zhu said. Different people taste the same rice varieties differently, so using the right control sample is also important. "If the control sample is not good, then the tasting results will be poor for sure," he said. After years of experience, tasters can identify the area where a rice grain has been cultivated from the first bite. Consumers looking to choose rice that suits their taste can follow some simple rules of thumb, Zhu said. "First, take a look at the rice grains. If the grains are crystal clear, then the rice will not be good to eat. You always look for the grains that carry a light earth yellow color," he said. "Second, use a plastic bag to store the rice for five minutes. If the rice still smells fresh after five minutes, then that is an indicator that it is good to eat."